I'm not crazy. I don't see what the big deal is about what happened. But apparently someone does think it's a big deal because here I am. I bet it was my mother. She always overreacts. Fifteen-year-old Jeff wakes up on New Year's Day to find himself in the hospital. Make that the psychiatric ward. With the nutjobs. Clearly, this is all a huge mistake. Forget about the bandages on his wrists and the notes on his chart. Forget about his problems with his best friend, Allie, and her boyfriend, Burke. Jeff's perfectly fine, perfectly normal, not like the other kids in the hospital with him. Now they've got problems. But a funny thing happens as his forty-five-day sentence drags on: the crazies start to seem less crazy. 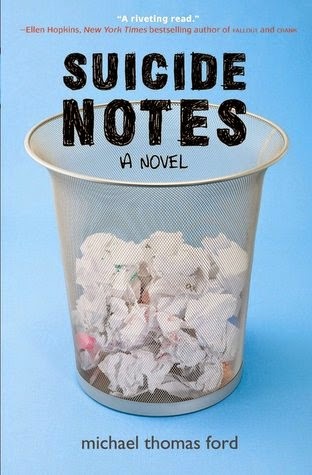 Suicide Notes has 45 chapters, each one representing a day in the life of 15-year-old Jeff, who is in the psychiatric ward of a hospital after his suicide attempt on New Year’s Eve. Trust me; this story is not nearly as depressing as it sounds. Jeff is quick, witty, sarcastic, and absolutely hilarious as he manages to evade any “real” discussion with his psychiatrist, Dr. Katzrupus, also known as Cat Poop, about what made him try to kill himself. During his 45-day “sentence”, Jeff learns more about himself as he endures individual and group therapy, makes friends, experiences grief and loss, and comes to terms with his sexuality. The story takes a more serious turn when Jeff gradually opens up to Cat Poop, and details of his family life, his friendships, the events that led to his suicide attempt, and the reason for it begin to unfold. I really loved this story told from Jeff’s perspective and had a very difficult time putting it down. His thoughts, feelings, confusion and pain all rang true and brought me back to my own teenage years. I would highly recommend this story to teens that are gay, straight, or somewhere in between, and to adults who remember what it was like, or just want to understand.